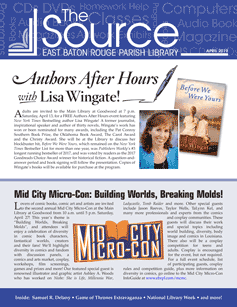 The Source is the EBRPL monthly newsletter, with events, resources, news and announcements. Previous editions of The Source can be located at The Source Archives. For more information about events, search or browse our Events Calendar. For even more events, view Locations and Hours - every branch has events listed. You never know what valuables are hiding in your attic. That dusty, old Archie comic book collection you've held on to for decades could actually be worth something! This annual program features local and regional collection specialists who will identify items the public brings for evaluation. There is usually a limit of three items per person. Although some collection specialists may feel qualified to offer monetary appraisals on items, the program is intended to offer only identification and evaluation. Library books and magazines on antiques, collecting, restoring, and appraising will be available and can be checked out. The collection specialists will evaluate items including dolls, stamps, coins, jewelry, pottery, beads, glassware, general antiques, books, and paintings. For more information, call 231-3750. The Author/Illustrator Program affords teachers, librarians, parents and other interested adults an excellent opportunity for an exchange of ideas with prominent writers, artists, scholars and performers of literature for children and young adults. Some of the most notable artists in the field of literature who have been featured include Patricia and Fred McKissack, E.L. Konigsburg, Steven Kellogg, Paula Danziger, Mercer Mayer and Richard Peck. Book clubs are alive and well at the East Baton Rouge Parish Library! Groups meet monthly at several of our branch libraries to discuss selected books. You can find more information and book club meeting times in our Events Calendar. Learn all the right moves! Sign up for Beginning Chess Lessons at the Main Library. Classes are for students, ages 9 through 13; others may attend with permission of the chess coach if a parent stays to supervise. For registration information, call 231-3760. The Library offers free computer classes, such as Basic Computing and Word Processing, Computers Without Fear and Searching the Internet to the public free–of–charge. You can find more information and computer class times in our Events Calendar. Beginning genealogists interested in tracing their family histories should attend an introductory genealogy class. Genealogy staff will discuss how to gather information from home and family, locate sources, get organized, and examine vital records. Staff regularly teach more advanced classes, too. For information on genealogy classes, call 231-3751 or visit the Genealogy InfoGuide. The River Center Branch Library holds a large collection of materials on grants and grant writing for public use. The Foundation Center Cooperating Grants Collection, one of only five such collections in Louisiana, includes access to Foundation Directory Online and Grants to Individuals Online. Directories of private and corporate foundations, books on writing grant proposals and administering grants and details on recently funded grant proposals are also available. Use of the collection and additional resources available at the Library are highlighted at workshops held during the year. For further information, call 389-4967. The Library is grateful for the generosity of patrons who donate used books. Many, but not all of these books are added to the Library collection. We base the decision on which of the gifts to keep on the condition of the item and the needs of the collection. Books not selected are given to POPL for their monthly book sales. The sale is held on the last Saturday of each month from 9:00 a.m. until 2:00 p.m. at Recycled Reads, our library's book sale facility. The facility is loacted at 3434 North Boulevard, on the corner of North Boulevard and Acadian, across the street from Baton Rouge General. Proceeds of the sale go to the Patrons of the Public Library, the Library's friends group. The Library must periodically remove from the collection extra copies of titles that are no longer in great demand, books that have been superseded by newer editions, books that are in poor condition, etc. These items may be offered for sale at Recycled Reads. Storytime involves children in stories, poetry and songs for a fun-filled library experience. Storytime provides an excellent opportunity to introduce young children to books and the library, to increase their attention spans and to develop social skills. The Children's Services staff of the East Baton Rouge Parish Library hopes Storytime will be an enjoyable experience for your child, leading to a lifelong love of books and reading. You are always welcome to attend Storytime with your child. Since children develop at different rates, you may talk with one of our library staff members to place your child in a younger or older group. We offer four different Storytime formats for children. You can find a list of current storytimes and locations on our Events Calendar. Call your local library for more information. Summer is the perfect time to enjoy reading and special activities at the Library! There are reading programs for everyone — children, teens and adults — and a wonderful array of programs, performances and activities.